Christina has been with the Khoury Centre since 2003. Once introduced to chiropractic by Dr. Khoury it changed her whole approach on the importance of health and wellness. She’s the front desk supervisor which keeps her busy handling patient’s many needs. Her knowledge on health insurance and supplement questions gives patents piece of mind while helping them understand their needs. She assists the doctors in the many clinical tasks, ensuring patients are receiving the utmost care. 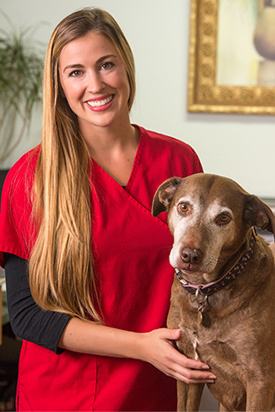 While bringing her therapy dog Cocoa to the office this duo is sure to give patients a more welcoming and comfortable experience. Christina’s aspiration is to finish her nursing degree. She also enjoys cooking and living an active lifestyle.